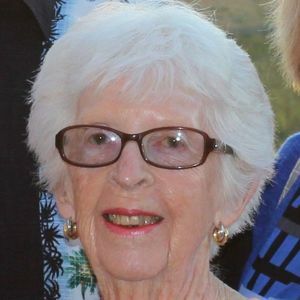 Patricia G. Brady, 90 – of North Wildwood, NJ, passed away peacefully on Thursday, March 21, 2019. Born in Philadelphia, PA to the late Joseph and Mildred Bowen Murphy, she has lived in Cape May County for over 65 years. She was a member of Our Lady of the Angels Church. She worked for the City of Wildwood for 27 years and retired as the Secretary of the Planning and Zoning Board. Her greatest joy, however, was spending time with her family especially travelling on family vacations and attending her grandchildren's and great grandchildren's activities. Patricia is survived by her daughters Kathleen (Bruce) MacLeod and Peggy Brady; her three grandchildren, Jennifer (Bernard Parks) MacLeod, Ryan (Katelyn West) MacLeod, and Brad (Katie) MacLeod; her six great grandchildren, Tyler, Jack, Max, Addison, Emily, and Landon; sister-in- law Anne Brady as well as numerous nieces and nephews. She was preceded in death by her husband, William J. Brady, her grandson Rory, her granddaughter-in-law Stephanie MacLeod, and her brothers, Norman and Edward Murphy. Funeral Mass will be said on Friday, March 29, 2019 at 10:00 a.m. at Our Lady of the Angels Church, 35 East Mechanic Street, Cape May Court House, where visitation will be from 9:00 to 9:45 a.m. Interment will be in St. Mary's Cemetery, Cold Spring. Memorial donations may be made to Friend in Need, P.O. Box 5, Avalon, NJ 08202 or to Lungs for Linda Brady at https://www.gofundme.com/ykdpcf-lungs-for-linda. I met Pat at our favorite shore point of Wildwood in the mid 40's and became friends. I have many wonderful memories of those younger days. Then, who would have ever thought that 2 friends would marry 2 brothers. We made more fun memories throughout the years adding kids to the group. I was fortunate to have known Mrs. Brady as a kind and loving woman. I pray that Peggy and Kathy and their family are comforted in the memories they hold dear and love of friends.